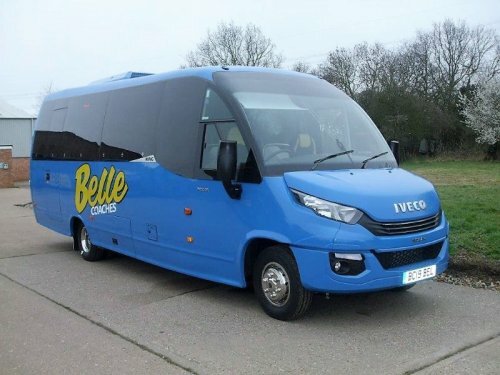 Belle Coaches of Suffolk has recently taken delivery of an Iveco Daily Indcar Wing 8.5m 29-seat plus courier and driver midi- coach from Moseley (PCV) Ltd. The three-litre inline four cylinder Iveco engine develops 180bhp and meets Euro VI emissions standards; the gearbox is fully automatic and incorporates a Telma retarder. The interior has Active 30+ reclining seats with leather-look headrests, piping and side trim, three-point seatbelts, footrests, curtains, upholstered ceiling centre, luggage rack, wood effect flooring and carpet to the guide, driver’s area and boot. USB points are also fitted to all the seats. Air-conditioning is provided by a Thermo King SR380 system with individual outlets through the passenger service units. An entertainment system is fitted with a microphone for the guide. Belle Coaches can trace its heritage back to the early 1920s. The current portfolio of operations from its Lowestoft and Leiston depots includes private hire, school and shopper bus services, UK and Continental tours and Norwich City Football Club excursions to home games from the surrounding area.